Mainbody (summer) was supposed to start on Monday with the arrival of a hundred plus people on the first flight. After that, we'd keep getting flights every other day until the 17th. Our population wouldl jump to 600 in the first week and then plateau off near 1,000. Instead, not a single plane has arrived. We are playing the waiting game. The people in Christchurch are generally loving the delays because they get paid extra per diem money every day that they are there. Some people make more on per diem than they do while working if they are frugal. For the folks on the first flight, it can be hard because they have to get up every day before 5am to find out if they are flying. However, the second and third flights don't have to wake up. They get to play each day until that first flight gets out. It is a great chance to explore a new place on the company dollar. The flip side is that some people here thought they were leaving the ice on Monday. The first extra day on the ice was fine. They still get paid and got to wrap up loose ends. The second day they really thought they were out of here because the plane took off. Unfortunately, it boomeranged because as it approached the weather got terrible. The people on the flight had a five hour flight turn into nine hours. Some of the people here got pretty demoralized. I can't imagine the third and fourth delays have improved their mood. Interestingly enough, the snow has cleared and it looks like a nice day outside, but I don't have to fly through it. 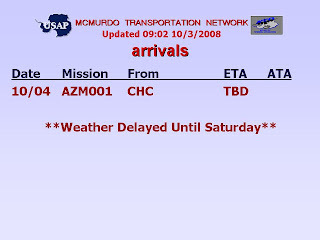 Back to waiting . . . .
i was once stuck in minneapolis for 3 days because of weather conditions in the midwest and east coast. more than half the airport closed down. what was supposed to be a 2 hour layover turned out to be 3 days of checking in and out of hotels. each morning, i'd wake up to check the flight report to fly out only to find out that even as we buckled our seatbelts, we'd eventually be asked to leave the plane and go back to find a hotel. it was exhausting. so i feel for your people who are waiting to fly in/out. btw, have you made your decision?? ?